If you or your business are at the centre of a fraud investigation, you may understandably be feeling distressed, angry or worried. Facing such allegations can leave even the strongest people feeling overwhelmed, which is why we recommend getting in touch with fraud solicitors as soon as possible. Our team of Manchester fraud solicitors will be by your side every step of the way, researching the circumstances in detail before putting together a strong case to defend you. We’ve spent years defending people accused of everything from banking fraud and credit card fraud to insider trading and mortgage fraud. With the help of our team of experienced fraud lawyers in Manchester, you can access the best possible defence. To speak to a member of our team, please contact our Manchester office today by calling 0161 827 9500 or fill in our contact form to get a call back. From the moment the police call you in for an ‘informal chat’ or arrest you on suspicion of a fraud-related crime, we’ll be by your side. We’ve helped hundreds of clients avoid having to go to court but if that’s not possible in your circumstances, we’ll be with you every step of the way, guiding you through the process. Equipped with more than 35 years’ experience, our team of fraud solicitors in Manchester are well prepared to handle your case. We understand how difficult a time like this can be, which is why we’ll aim to put your mind at ease and reassure you that you’re in safe hands. We’ll do everything we can to build a proactive case, provide you with first-class legal representation and achieve the best possible outcome. Our support is around-the-clock, so whether you need us morning, noon or night, we’ll be available to answer any questions or queries. If you or your business is being investigated for criminal or fraudulent activity, you’ll need a team of dedicated fraud solicitors by your side. 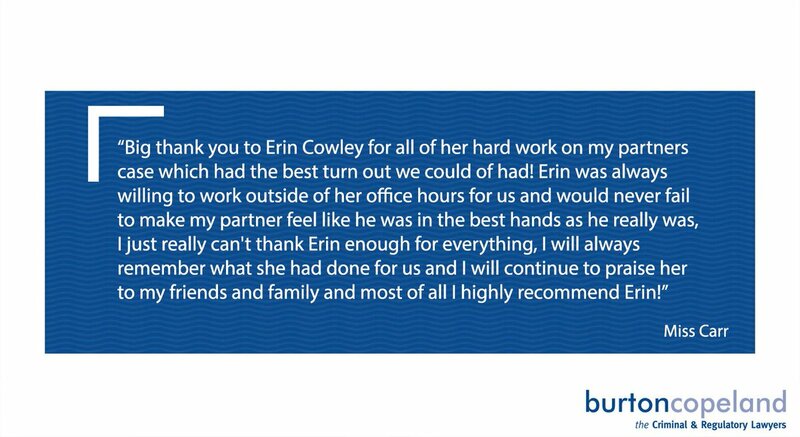 Get in touch with Burton Copeland today. You can reach our solicitors by calling 0161 827 9500 or, if you’re calling outside of office hours, 0161 832 7834.